The American bison became our “national mammal” when President Obama signed the National Bison Legacy Act into law in 2016. The designation is appropriate, recognizing the parallel paths followed by this magnificent animal and the American approach to conservation. The first Saturday in November has been recognized as National Bison Day since 2013. I’ve listed it on November 2 because—well, the history of conservation is a little light for this day. But American bison aren’t light. They are heavy! The bison (Bison bison) is the largest land animal in North America. Males stand up to 6.5 feet tall at the hump on their shoulders and reach 12.5 feet in length; females are a bit smaller. Large males can weigh well over one ton. The front of the bison body is well insulated, with heavy fur and thick fat deposits, allowing it to withstand low temperatures, roaring winds and blizzard snows. In a seeming defiance of the weather, it faces into any storm—what better symbol for the American spirit! That passing away occurred in the Great Plains after the closing of the frontier in 1869, when railroads first reached in a continuous track from coast to coast. Bison hunting became big business. Techniques were developed for tanning bison skins into high-quality leather. Bison bones were identified as excellent raw materials for fine-bone china, and bones also were used in sugar refining and as mineral supplements in fertilizer. Bison meat was harvested to feed railroad-building crews, and massive amounts were wasted. From the comfort of luxury railroad cars, wealthy adventurers took up bison hunting. A railway engineer in 1873 said that one could walk 100 miles along the Santa Fe railroad by stepping from one bison carcass to the next, never touching the ground. By 1883, the bison was nearly gone from the United States. The few remaining herds numbered only a hundred or so animals, and all existed only in protected areas like Yellowstone National Park. The loss of bison was dramatic, but the circumstance was being repeated for species after species. The Passenger Pigeon, once the most common bird on the continent, was gone from the wild. White-tailed deer and Wild Turkeys were similarly hunted to near extinction. Many bills were introduced toward the end of the 19th Century to protect bison, at both state and federal levels. Few made it into law and those that did were mostly ignored. Bison, like other aspects of the environment, were low priorities to a country bent on conquering nature. Things began to improve in 1900, when the federal government passed the Lacey Act. This law prohibits trade in fish, wildlife and plants across state lines if they have been illegally taken. When state laws began to make commercial harvest of wild animals illegal, the Lacey Act effectively ended market hunting. And the good news, as we know, is that the American bison has made a dramatic recovery (and so have many other wild species). Today, about 20,000 wild bison live in the U.S. and Canada. Almost all are in protected areas like national parks and bison preserves. The IUCN Red List categorizes bison as “near threatened” (just one click above “least concern”) with stable populations, but dependent on the continued care of conservation organizations and government agencies. Moreover, about 160,000 bison now live on private farms, where they are raised for food and other products. 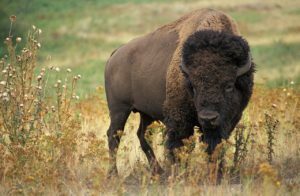 As the National Bison Legacy Act states, “Bison are considered a historical symbol of the United States; bison are integrally linked with the economic and spiritual lives of many Indian tribes…; bison can play an important role in improving the types of grasses found in landscapes to the benefit of grasslands”—and much more. Govtrack. S. 2032 (114th):National Bison Legacy Act. Available at: https://www.govtrack.us/congress/bills/114/s2032/text. Accessed November 1, 2017. IUCN. Bison bison. IUCN Red List. Available at: http://www.iucnredlist.org/details/2815/0. Accessed November 1, 2017. National Bison Association. 2016. 2016 National Bison Day Declared. Available at: https://bisoncentral.com/press-release/2016-national-bison-day-declared/. Accessed November 1, 2017. University of California-Berkeley. Buffalo Quotes. Available at: https://nature.berkeley.edu/departments/espm/env-hist/espm160/assignments/buffalo/buff_qts.htm. Accessed November 1, 2017. U.S. Fish and Wildlife Service. Time Line of the American Bison. National Bison Range Wildlife Refuge Complex. Available at: https://www.fws.gov/bisonrange/timeline.htm. Accessed November 1, 2017.